Thanks for the emails and suggestions for "Make it Better" recipes. I am testing out recipes in my copious free time (smile) so don't think I have forgotten your suggestions...I just want to make sure anything I develop as a recipe is more than just "Make it Mediocre." I love pudding, but not all the ingredients in a typical pudding instant mix. I know, I know, sometimes a girl just has to let loose, get crazy and use a mix...but I have always wondered if I could make it better. 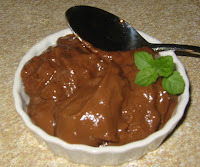 This recipe can be used for chocolate pudding, dark chocolate pudding or plain Jane vanilla. It is relatively simple, all natural and low, low fat (ok, the dark chocolate has some added fat, but bonus! it also has good-for-you antioxidants). Mix all ingredients *except* vanilla in a heavy saucepan. Heat to medium high heat, and stir with a whisk. Be sure to continue stirring so nothing settles to the bottom of the pan and burns. Bring the mixture to bowl, ask you are stirring constantly, and then immediately reduce the heat to a simmer, simmer 1 minute or until the mixture thickens a bit. Remove from heat, mix in the vanilla and let cool a bit, pour into a bowl and cover the top with wax paper or saran wrap (this prevents it from getting a "skin"). Refrigerate for a couple hours or until set. **The above recipe is fat free. To make it even more delicious and down-right decadent, take a 3.5 oz dark chocolate bar like this one- and break it into pieces. Taste a couple pieces (hey, we are big into quality control in the Sweet Pea home) and throw the rest into the pudding immediately after you add the vanilla and stir until is melts and is incorporated. **For you vanilla fans out there, omit the cocoa powder and increase the vanilla to 1 T.
I second that slacker mama. I can't wait to try this!!!!!!!!!!! And yes, I meant to put all those exclamation points. Can you add a print recipe button so we dont have to print the entire web page? Thanks.